Our Earth's Secrets Palo Santo are all natural, harvested and exported under the Peruvian government supervision. All of our palo santo are sustainable harvested. 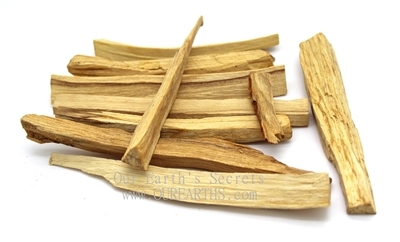 Palo Santo has a fragrance described as "wild vanilla, copal, citrus and sweet esters." It is truly a unique smell and is natural from the bursera graveones trees of South America. This product is packed by weight and may contain large pieces. Large pieces can be easily cut into smaller pieces with a kitchen knife or cleaver.